A New Zealand squadron leader, flying-boat captain and airliner pilot on a life of aerial adventure Though rarely seen above the small sheep farming town called Ranfurly in Central Otago in the 1940s, Tom Enright developed a fascination with planes from an early age. He joined th... read full description below. 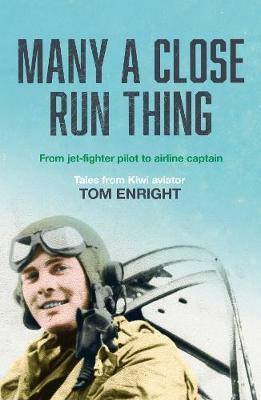 A New Zealand squadron leader, flying-boat captain and airliner pilot on a life of aerial adventure Though rarely seen above the small sheep farming town called Ranfurly in Central Otago in the 1940s, Tom Enright developed a fascination with planes from an early age. He joined the Royal New Zealand Air Force as an engineer in 1951 and was sent to England at just 16 to attend the revered Royal Air Force college in Cranwell, graduating as a pilot. He returned to New Zealand to join the Vampire fighter squadron in Ohakea and became a member of the RNZAF aerobatic team, before becoming chief flying instructor at Wigram air base. Later Tom spent time flying an old Sunderland flying boat to isolated communities in the South Pacific, often to the upper limits of the Sunderland's endurance, picking up victims of tetanus, taking KFC to the Cook Islands, and flying into secret US airbases. This is his story of the thrills, near-misses and high-altitude drama of a pilot ace.